Perhaps it’s the idea of Madonna remaking Casablanca, or it could be that I’ve been listening to Rachid Taha and Jerry Reed in the same playlist, but whatever it is, it has given me the inspiration for a remake of another classic movie, reset in modern day, war-torn Iraq. The film: Smokey and The Bandit. The remake could still center on truck drivers Bo “Bandit” Darville and his partner Cletus “Snowman” Snow. As a Basset Hound owner, I, of course, would be dismayed if they didn’t include Fred. But rather than hauling a cargo of 400 cases of contraband Coors from Texarkana to Atlanta, they could haul oil for KBR-Halliburton. The Snowman would still drive the semi (this time full of full of “Texas Tea” instead of beer), with the Bandit still driving the “blocker” car, a decoy to distract rogue militiamen away from the Snowman and his shipment. Rather than “Smokey” referring to state troopers, it could refer to the head the pursuing Sunni insurgents who is seen in every seen puffing on a hookah. Instead of Sheriff Buford T. Justice, he could be Sharif (something) T. Jihad. Bandit could still pick up a runaway bride along the way, only this time she would be wearing a burkha instead of a wedding dress and bridal veil. 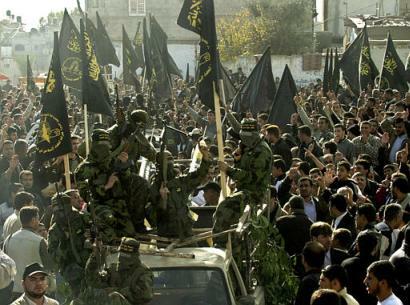 There could still be high-speed chases, but the ’76 Pontiac LeMans with which the sheriff/sharif pursues our heroes would have to be replaced with a Toyota truck loaded down with RPG and AK-wielding militiamen. It could still fall apart piece-by-piece as it is subjected to car-crash-after-car-crash as the Sharif and his henchmen attempt to deter Bandit and the Snowman from their appointed rounds. … the right of the Legos to keep and bear Arms, shall not be infringed. Whether your Legos are engaged in a secret mission for the Kaiser, bus’in’ a cap in some Slob, or mobilizing for a jihad, they can now be armed appropriately thanks to those Basil Zaharoffs of the Lego world, the fine people at Brick Arms. Madonna wants to remake Casablanca. Not even those whose acting talents far exceed Madonna’s, such as Peter Paul and David Paul, should try to retell a story that has already been told flawlessly. If that weren’t bad enough, she wants to set it in modern-day, war-torn Iraq. Furthermore, to make matters worse, Madonna, who is pushing fifty, wants to play Ilsa Lund, the role played by Ingrid Bergman when she was in her twenties. Perhaps if someone threatensto let Taylor Hicks remake Like A Virgin, she’ll back off. Also worth looking at www.memocast.com where you watch low-res Russian epics (like Chapaev or The Quiet Don) streamed for free or available as higher-res pay downloads (though I haven`t tried that yet). There are pics of some interesting (and apparently original) RCW flags on this militaria site – http://www.forvalor.com/DougD/flags.htm – and some interesting uniforms on the Pre-1935 page. Sylvester Stallone appeared (by phone) on Friday’s Glenn Beck Show discussing the new Rambo movie. You know, it’s really am an act of attrition. Nobody wanted to make Rambo just like nobody wanted to make Rocky because the whole business paradigm has changed so much that it’s all about use films and concept films and Rambo‘s considered low concept compared to what’s happening today. And luckily there is a man named Javy Lerner of New Image Films, said “Let’s give it a shot.” I said we’ve got to find something pertinent to write about. So I wrote a story about Mexico and MS-13 and let’s go into that area. 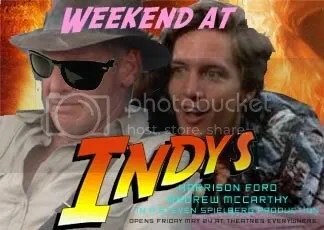 I thought that would be kind of intriguing like a modern day western. I thought that’s a little too close to home and I don’t know if that’s going to be around the world. So then I called Soldier of Fortune magazine and certain individuals and said where is the most egregious display of human right violations on the planet? They said, Burma, and no one knows about it because the Chinese and the Burmese spend millions of dollars a year with Washington and lobbyists to suppress what’s going on. So I investigated and it almost simplified it. It’s like The Magnificent Seven. You have a group of small peasant being overwhelmed by the second largest Army in the Far East and they’ve held on for 60 years, Glenn, and they are hanging on by their nails and they have these missionaries, these Christian workers, from Oklahoma, Chicago, bus drivers, policemen, they pool their money together, they go and they bring medicine and Bibles and I thought, I could create a story around this, of Rambo being this atheist and he’s a boatman going up and down the river and he’s the only way they can get into Burma down the river and then the adventure begins. His story begins, a man completely pessimistic about a man who spent his entire life up to his waist in blood and realizes war is natural; peace is an accident. Magnificent Seven? I doubt very much it’ll be John Sturges, and it certainly won’t be Kurosawa, but the whole Burma story and the comparison to the Magnificent Seven/Seven Samurai peasants may have just sold me my very first ticket to a Rambo movie. I don’t know — I don’t mean this in a bad way. It’s almost like Father Goose. I kind of got the Cary Grant image of, jeez, you’re on the boat and you are kind of going and you’re going against your will. Kind of? And people say I have to much time on my hands. Oh yeah, at least I never had the time to build a diorama of the Battle of Pelennor Fields from The Return of The King using nothing but candy. The Black Gestapo: When They Make War, It’s All Out … All The Way Out! 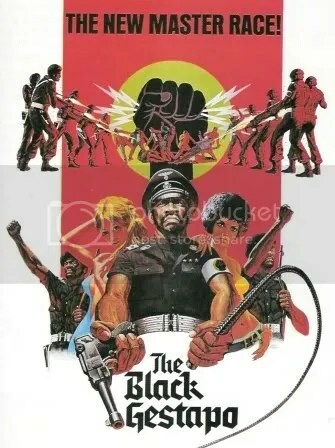 One of the classics of the 1970s blaxploitation genre was 1975’s The Black Gestapo, the story of “The People’s Army of Watts,” an inner-city vigilante force which grows from a ineffective self-defense force into a sieg heiling juggernaut of Badness. And, yes, that is Charlie Robinson, the guy who played Court Clerk MacIntosh “Mac” Robinson on Night Court back in the eighties. 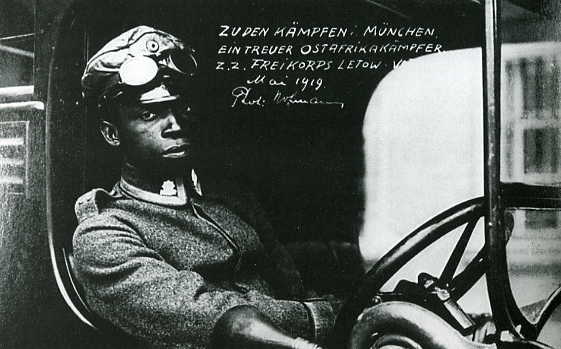 While there is no evidence of any real black Gestapo, there was at least one black member of a pre-WW2 Freikorps. Granted, he was a member of Freikorps Lettow-Vorbeck and served as the General’s personal driver, but still he was a uniformed Freikorps member nonetheless. I know that von Lettow-Vorbeck himself spend the Second World War in relative obscurity, but I would love to find out what happened to his askari driver during those years.